Case Histories | ASTRALCOM - Content Strategy, Conversion Marketing and Customer Acquisition. Reviewing what ASTRALCOM has done for other clients provides a good perspective of capabilities, achievements and success. For this initiative, Hurley wanted to develop a “network employee” online shopping system – one strictly for use by Hurley employees and the employees of the Nike, Inc. network, which include Nike, Bauer, Converse, Hurley and Cole Haan. And, they wanted it done within a two-week period. In initial meetings with Hurley, it became clear that this digital business solution needed to integrate with their legacy system that then tied into a specific warehouse. Part of the challenge in creating an effective solution meant that the inventory of this online store needed to be seasonal only. Once items for spring were launched, the warehouse would not replenish this inventory. In turn, that meant that the online store could only display what was actually available. So, ASTRALCOM had a few hurdles to overcome in order to deliver the requested functionality. To begin, an authentication-based Cold Fusion shopping cart was created that “sits on top” of the inventory where available product display is controlled through an image management system that regularly sweeps the image directories to ensure that everything is accurately displayed and accounted for. Underneath this architecture, ASTRALCOM developed a digital solution where exported inventory is imported hourly from Hurley’s legacy system into an SQL database via DTS import, called through stored procedures. The inventory is then replenished each time between imports/exports to keep the numbers – and the online store display – accurate. Finally, when an online order is placed, it is fed directly into the legacy system for fulfillment. Now that’s digital business done right – and within the two-week window that Hurley wanted. Even before we started, Hurley knew that ASTRALCOM was the right e-business team for them. “We made the decision to go with ASTRALCOM based on their amazing reputation for meticulous work and fast paced service” said Pete Rocky, Online Marketing and Business Manager for Hurley. Without a significant investment, Hurley was able to quickly deploy a fully integrated online commerce solution and open up their business in ways that only the Internet would allow. Now, Hurley can generate extra revenue that would’ve never happened before ASTRALCOM got involved. Not everyone gets the kind of access to sporting events that the press and the event workers get. These pros get behind the scenes and “in the trenches” of the event – seeing, hearing and otherwise experiencing things that general admission fans never get to experience. 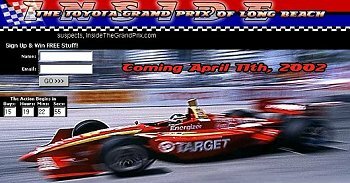 The Annual Toyota Grand Prix of Long Beach runs through the streets of downtown Long Beach and generates an economic impact of approximately $39 million-making it the largest paid spectator special event in Southern California. While the three-day event weekend draws over 225,000 spectators, only a select handful of individuals are allowed access to “behind-the-scenes” areas. How do race fans get closer to the event, closer to their favorite drivers? How do fans get behind-the-scenes and experience all the “real” action? Unless you are the press or an event related vendor, you can’t—until now… Building the Platform for Ultimate Fan Loyalty even before the race started, we had divided the event into specific categories and assigned team coverage to these areas. The teams were equipped with walkie-talkies, recorders, cameras and other necessary equipment. Each coverage team consisted of a “spotter” (to keep their eyes open for photo opps, celebs, and interviews, etc) and a photographer and/or sound technician (to capture the experiences of the sights and sounds of the event). With an already established chain of successful and well known establishments the creators of Hof’s Hut Restaurants created a new expansion chain and called it Lucille’s BBQ Restaurants. An overnight sensation, Lucille’s quickly grew to 7 locations and each one is packed with happy and hungry diners every night. 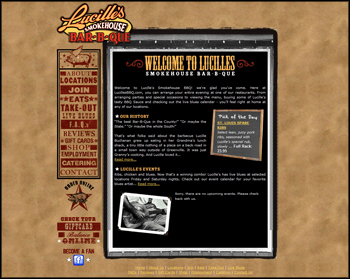 Creating an ultra user-friendly system was a top menu item and so we cooked up a seamless e-commerce application and some unique content management solution (CMS) side orders that enabled Lucille’s to launch and maintain a successful e-business. “This e-commerce and digital business stuff is really a new world for me and working with ASTRALCOM has made it much easier than I had originally expected,” says Joannne @ Lucille’s. In today’s hyper-competitive world, it was a primary concern of the Mancini Institute to further their outreach efforts and provide valuable post-curriculum services to the Mancini Institute alumni. The Mancini Institute draws students from around the world and maintaining contact with the alumni and between alumni is a challenge. ASTRALCOM was called upon to help orchestrate a student recruitment, retention and promotion platform that enables students and musicians from around the world to interact and experience each other’s career advancement and to promote themselves to the world community. ASTRALCOM, in concert with Mancini Institute, developed a comprehensive virtual concert hall wherein Mancini Institute staff, students, guest artists and composers can showcase their musical talents, announce performance dates and show times, collaborate and maintain contact with other Mancini Institute staff, students, alumni and the public. The Mancini Institute’s online presence is a customized fully integrated CMS/CRM model that helps automate and streamline many functions within administrating and maintaining a large member-based web presence. As the creator of the “Rambo” character and also the main influence of the subsequent Rambo movies, David Morrell contacted ASTRALCOM to help in developing an effective fan attraction and retention platform to be deployed on the web. As a primary means of maintaining contact with David’s worldwide fan base, we created and developed a robust solution that included several content management solutions (CMS) and customer relationship management (CRM) elements to help him effortlessly keep in contact with his fans. Event Calendar – David posts book signings and other events of interest. Books Section – Enables David to post new books and write his own descriptions. Frequently Asked Questions (FAQ) Section – fans can get their questions posted. Email Broadcaster – David can send all his registered fans periodic announcements. Registered Fan Base – Enables maintenance of fan base emails and preferences. Website Statistics – Provides precise, detailed data on website effectiveness. Prior to this new digital business solution, David wasn’t really able to connect with his fans. Now, David can maintain close contact with his fans all across the world and can involve them more in his future writings and releases. This digital solution also enables David to organize his published writings for easy reference and access on the website and also provides his fans with an in-depth collection of David’s total works.